In the Indian country south of Kansas there was dread in the air; and the name, Stand Watie, was on every tongue. A hero to the rebel, a devil to the Union man, Stand Watie led the Cherokee Indian Na-tion fearlessly and successfully on savage raids behind the Union lines. Jeff came to know the Watie men only too well. He was probably the only soldier in the West to see the Civil War from both sides and live to tell about it. Amid the roar of cannon and the swish of flying grape, Jeff learned what it meant to fight in battle. He learned how it felt never to have enough to eat, to forage for his food or starve. He saw the green fields of Kansas and Oklahoma laid waste by Watie’s raiding parties, homes gutted, precious corn deliberately uprooted. He marched endlessly across parched, hot land, through mud and slashing rain, always hungry, always dirty and dog-tired. Rifles for Watie was written in the mid 1900s. 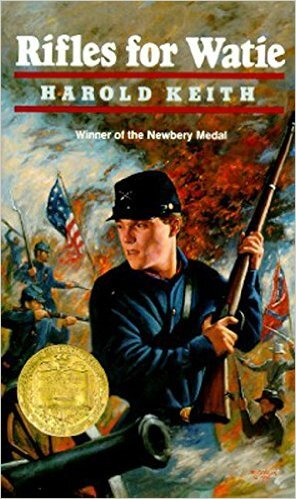 The author actually interviewed Civil War veterans to write his book. Because the main character is fighting for the North, the book is sympathetic towards the North. The book does point out the flaws of both the North and the South. Like all historical fiction books, there are several historical errors, but the book does include some good historical facts. Because it is a war book, there are descriptions of bloody battlefields and a few scenes where men are executed. This book is focused more for late middle-school and junior-high boys. The book does take a while to get into, but it can become a thriller once a few chapters in.